It is recommended that you read each Training Module in numerical order. Users can manage their Call Forwarding rules using this cheat sheet. Updated glibc packages that fix one security issue are now available for ScopServ Distributions built on CentOS 5. Red Hat Product Security has rated this update as having Critical security impact. A Common Vulnerability Scoring System (CVSS) base score, which gives a detailed severity rating, is available from the CVE link in the References section. The glibc packages provide the standard C libraries (libc), POSIX thread libraries (libpthread), standard math libraries (libm), and the Name Server Caching Daemon (nscd) used by multiple programs on the system. Without these libraries, the Linux system cannot function correctly. Looking for a cheat sheet to manage your personal mailbox options? When SIP initiates the call, the INVITE message contains the information on where to send the media streams. ScopTEL uses itself as the end-points of media streams when setting up the call. Once the call has been accepted, ScopTEL sends another re-INVITE message to the clients with the information necessary to have the two clients send the media streams directly to each other. When SIP endpoints communicate by way of ScopTEL, ScopTEL will attempt to send SIP re-INVITES in order to allow the endpoints to communicate directly. This allows for the computational load on the ScopTEL server to be decreased while also lessening the latency of the media streams between the endpoints. In Destination tab: Select the desired destination, such a position. In Dial String tab: You specify the dial string used to make a call using this outgoing line. Simply put in first, choose a custom dial string and enter ‘X’. This configuration is not adequate but to validate the operation. In the menu Telephony –> Manager, Class of Service Tab, choose the Class of Service where you have defined your internal extensions. Outgoing Lines tab: Either you check the ‘Allow all outgoing lines’ or you include the LyncGW_Out line in the list authorized lines. 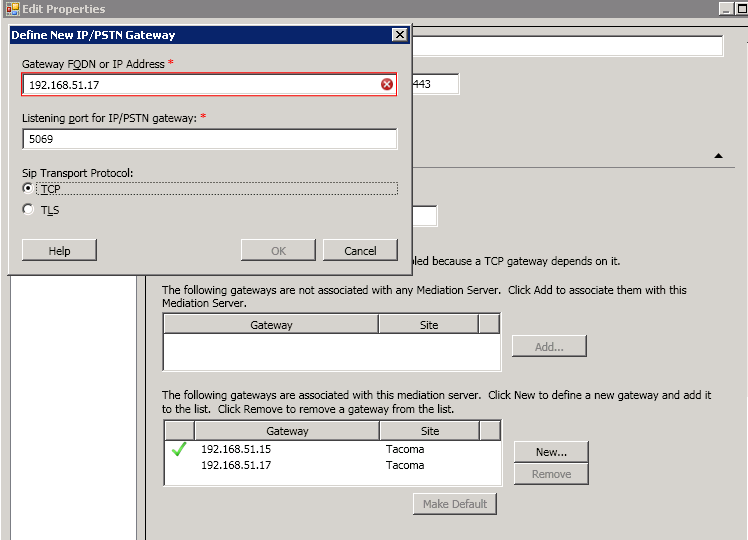 Install the mediation server, I used the Collocated option because load is low enough it doesn’t need a dedicated server. Under mediation server take note of the TCP Listening port, as that is the port you need to specify in sip.conf of Asterisk. It defaults to 5068 so that’s what I used. 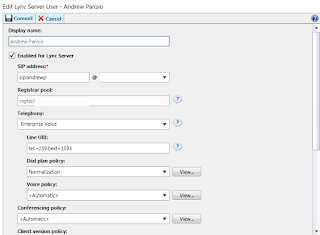 Click New, and enter the IP address of your Asterisk server, and the port you use for Asterisk TCP SIP (5060 by default). Note that mine has a red X saying i already have this address configured. This is because I was redoing the steps for this tutorial. 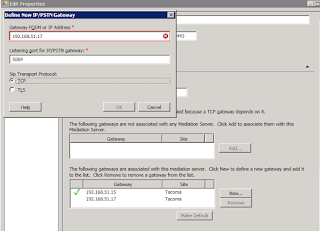 Also note I have two gateways added as my Asterisk server has multiple IP Addresses and you must make sure to enter all addresses in the gateway list. Once this is done make sure to publish your topology and re-run setup if you did not previously have the mediation service installed. I restarted my entire Lync server at this point but if you’d prefer you should be able to restart the Mediation service to apply the new settings. 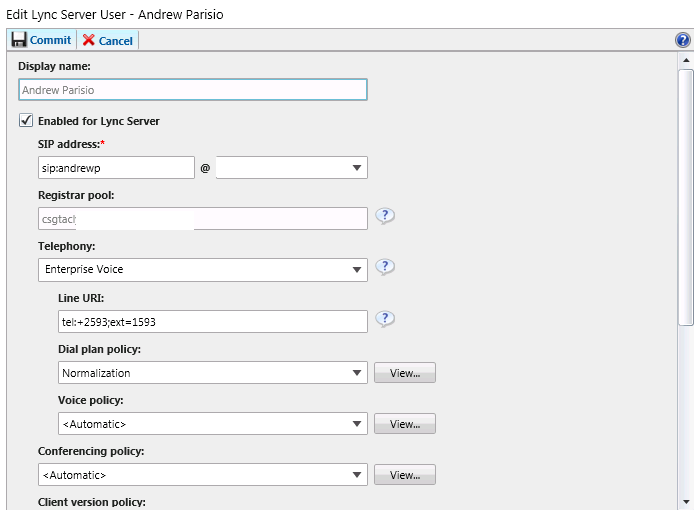 Open your Lync control panel, go to users, edit your test user and enable Telephony for Enterprise Voice. call from 1593 and know I am Andrew, and automatically authenticate me in to my own conferences..
Configure Voice Routing -> Dial Plan. These are the rules I wrote in OCS 2007 R2 and imported using import-cslegacyconfiguration. You will need to tweak them for your requirements. At this point you should be able to make/receive calls to and from Lync/Asterisk. Scenario: You are an ITSP peered with carriers to supply SIP trunks to customers using ScopTEL servers. In many cases it is desirable to have an extension shared across multiple devices. For example you have an extension 100 and you want it registered to multiple SIP User Agents such as: SIP Soft Phone, Wireless SIP Phone (DECT, WiFi), SIP Desk Phone. When someone calls extension 100 you want all devices to ring or ring with unique ring tones or just blink because you are monitoring extension 100 for someone else.